The Minnesota Vikings were undefeated at 5-0 as they hosted the Philadelphia Eagles on October 21, 1973. Head Coach Bud Grant’s team had not allowed more than 16 points in any game thus far, but while best known for strong defense, the Vikings were a formidable team on offense as well. 33-year-old QB Fran Tarkenton was an outstanding and mobile passer, rookie FB Chuck Foreman was potent as both a runner and receiver out of the backfield, and WR John Gilliam (pictured at right) provided speed on the outside. The line was solid. Philadelphia, under first-year Head Coach Mike McCormack, was 1-4-1 and a seventeen-point underdog. Coming off of a dreadful last-place finish the year before, the Eagles were rebuilding with an offense led by QB Roman Gabriel, a 12th-year veteran who had been obtained at heavy price from the Rams during the offseason. 6’8” WR Harold Carmichael was having a breakout season and rookie TE Charle Young further bolstered the passing game. The problem was with a thin defense in need of fortification on the line and at linebacker. It was a clear day at Metropolitan Stadium with 47,478 fans in attendance. The Eagles got the first break when Chuck Foreman fumbled at the end of a 16-yard run and DE Will Wynn recovered at the Minnesota 41. However, they weren’t able to gain much ground and Tom Dempsey’s field goal attempt from 44 yards was wide to the right. The Vikings responded with an 80-yard drive in six plays. Fran Tarkenton ran twice for 19 yards and John Gilliam ran for 44 yards and a touchdown on a well-executed double-reverse. Fred Cox added the extra point for the early 7-0 lead. The teams traded punts, each stopping just short of midfield. 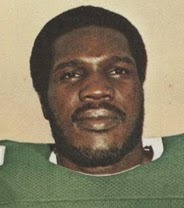 A Philadelphia series was then blunted when Harold Carmichael’s gain on a pass into the flat was nullified by a hurdling penalty as the rangy wide receiver leaped over CB Nate Wright. Following a punt, Minnesota moved methodically into Eagles territory on a series that extended into the second quarter. Tarkenton completed four short passes, with a 10-yard completion to WR Carroll Dale gaining the necessary yardage to convert a third down, and also scrambled for a 12-yard gain in a second-and-nine situation. But after reaching the Philadelphia 24, Cox’s field goal try from 31 yards was blocked by CB Joe Lavender. Another short series led to a punt by the Eagles, and the Vikings didn’t come up empty this time, advancing 65 yards in seven plays. In a third-and-seven situation, Tarkenton threw twice to Gilliam for 14 and 42 yards to the Philadelphia six. Three plays later, HB Oscar Reed leaped into the end zone from a yard out and, with Cox’s conversion, Minnesota was up by 14-0. Regaining possession with four minutes remaining in the first half, the Eagles put together a 10-play, 80-yard drive. HB Po James (pictured below) started off with a 17-yard carry up the middle and Gabriel completed five passes along the way. In a fourth-and-one situation at the Philadelphia 46, HB Tom Sullivan ran for four yards. A holding penalty nullified an apparent long scoring toss to Carmichael, but following a nine-yard gain by James on a draw play, Gabriel threw to Charle Young for 20 yards, to James for 12, and to Carmichael for 11. James ran the last 12 yards for a TD and, and with Dempsey adding the PAT, the home team’s lead was halved to 14-7. There was still 1:03 left in the period as the Vikings regained possession, but Cox was short on a field goal attempt from 53 yards and time ran out on the Eagles at their 31. Philadelphia had first possession in the third quarter but had to punt, and the short kick by Tom McNeill gave the Vikings the ball at their own 43. They went 57 yards in eight plays, the last a Tarkenton pass to a wide-open Gilliam for a 24-yard touchdown. Cox kicked the extra point to make it a 21-7 game. The Eagles responded with a 14-play, 76-yard scoring drive of their own. Gabriel, with his first of six completions during the series, threw to Young for a 24-yard gain. Four of his passes, in fact, were to the rookie tight end, the last for 12 yards to the Minnesota three, and two plays later FB Lee Bouggess ran for a two-yard TD. Dempsey’s conversion again made it a seven-point margin. In a series that moved into the fourth quarter, the Vikings came back with a 69-yard drive that took 13 plays. Tarkenton (pictured at left) had completions to TE Stu Voigt for 15 and 13 yards and Foreman outraced Lavender and FS Bill Bradley to the goal line for a five-yard touchdown. Cox again made it a 14-point game with the extra point. The teams exchanged punts before the Eagles put together a nine-play, 78-yard series. Gabriel threw to WR Don Zimmerman for 14 yards and to Carmichael for 19 in a third-and-10 situation and James had runs of 22 and seven yards. From the Minnesota 17, Young took a handoff on an end-around play and plowed over three defenders on the way to a TD. Dempsey initially failed to convert, but an offside penalty on the Vikings gave him a second chance that he made good on. The determined Eagles had again closed to seven points and there were four minutes remaining to play, but they never got the ball again as Minnesota was able to run out the clock, helped by Tarkenton’s 16-yard scramble that converted a third-and-nine situation. The final score was 28-21. The Vikings led in total yards (409 to 315) and first downs (25 to 19), with Minnesota’s total showing offensive balance – 217 on the ground and 192 net yards through the air. The Vikings suffered the game’s only turnover and managed to record two sacks, to one by Philadelphia. John Gilliam caught 6 passes for 116 yards and a touchdown and added another TD on his 44-yard run. Fran Tarkenton completed 16 of 21 passes for 202 yards and a touchdown with no interceptions and also ran for 49 yards on 9 carries. 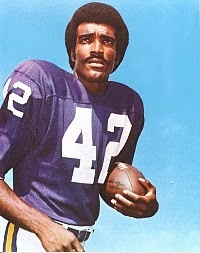 Chuck Foreman topped the Vikings with 68 rushing yards on 21 attempts that included a TD. For the Eagles, Roman Gabriel was successful on 23 of 32 throws for 201 yards and no TDs but also no interceptions. Po James ran for 78 yards on 11 carries that included a score and also had 6 catches for 25 yards. Charle Young (pictured at right) caught 6 passes also, for 86 yards, and had the 17-yard touchdown carry and Harold Carmichael contributed 6 receptions for 52 yards. The Vikings reached 9-0 before finally dropping a game and ended up on top of the NFC Central with a 12-2 record. They won the NFC Championship but were handily beaten by Miami in the Super Bowl. Philadelphia won its next two games and continued to provide exciting offense and mediocre defense on the way to a 5-8-1 tally and third place finish in the NFC East. John Gilliam went on to a Pro Bowl season as he caught 42 passes for 907 yards (21.6 avg.) and scored eight touchdowns. 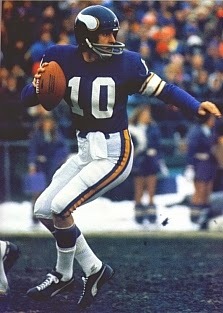 Fran Tarkenton remained efficient throwing the ball, completing 61.7 percent of his passes and compiling a career-high 93.2 rating while giving up only seven interceptions. Roman Gabriel led the league in pass attempts (460), completions (270), yards (3219), and TD passes (23, tied with Roger Staubach of the Cowboys) and was selected to the Pro Bowl. 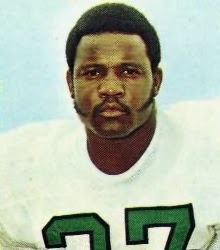 Harold Carmichael topped the NFL in both pass receptions (67) and yards (1116) and Charle Young received Rookie of the Year recognition for his 55 catches and 854 yards. Both receivers were Pro Bowl choices and received All-NFL recognition, with Young a consensus first-team honoree.